So What’s the Big Deal About the Johnson Amendment? As you know, President Trump recently issued an executive order on religious freedom and has talked a great deal about the need to repeal the Johnson Amendment. Most are wondering what would need to happen legislatively to repeal the Johnson Amendment and restore religious freedom and free speech to churches and nonprofit organizations. FRC hosted a Family Policy Lecture on the Free Speech Fairness Act with Congressman Jody Hice (R-Ga.) a week ago. In case you missed it, you can view the lecture here. So what does this legislation do? Americans should not have to give up their right to free speech when they work for a church or a nonprofit. Yet, that is the legal state of affairs under the “Johnson Amendment.” The Free Speech Fairness Act is a bill that restores free speech and religious liberty to churches and other nonprofits so that they are free to address all issues – even political candidates and causes. This bill is needed because America was built on the principle that free speech and the free exercise of religion are inalienable rights for all citizens. 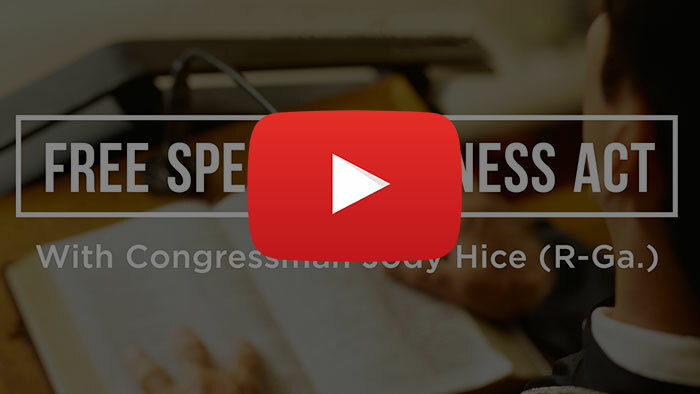 This policy lecture will help you stay informed on this important piece of legislation, and it lays out the specific reasons why all Americans, especially pastors, need to be concerned about keeping speech free and fair.